Good News: Thanks to great work by the fellows and our recruitment team, last spring we tripled our list of applicants for Kehillat Natan Fellowship. After careful consideration, Derech Hateva accepted a select number of new fellows who joined the 2008 Israel Trail Teen Adventure (ITTA). The Kehillat Natan Fellowship is open to high school students from Ethiopia, the Former Soviet Union and Israel's development town, as well as at-risk youth. This year we are excited to have the third cohort of Kehillat Natan Fellows join the team for 2008-9. Selected fellows begin their Kehillat Natan year with a full scholarship to ITTA and continues in supported guidance for a year of community and environmental service through self-initiated individual projects. At Kehillat Natan, our goal is to create a "Ripple Effect"- inspiring individual teens to impact their peers. Our 2007 fellows have had a busy year taking values from their summer experience with Derech Hateva back home to their schools and communities. Michael Sulimanov, hailing from Tel Aviv, is active in Aharai!, a non-profit organization which goal is to develop and cultivate a young leadership among youth from underprivileged communities. 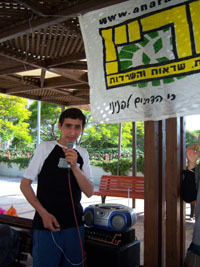 For his Kehillat Natan project, Michael Sulimanov, from the Former Soviet Union, initiated a secondhand "FreeCycle" market at school- collecting goods from surrounding neighborhoods and selling them all for two shekels each (with proceeds going to future programming), to encourage the reuse of used goods, as an alternative to buying new ones. Adopting Michael's "seed," the local municipality developed the idea into a multi-community-wide project, involving additional schools and inviting residents from the surrounding neighborhoods. Mashresha G., immigrant from Ethiopia and KN '07-8 fellow recently said of his Kehillat Natan experience: "I learned to look my peers in the eye. I learned to listen & I learned to lead. Kehillat Natan opened up the world for me." As part of his year-long project, Masresha led a series of fun and innovative activities for new immigrants from Ethiopia in 9th grade at his school, Yemin Orde, near Haifa. 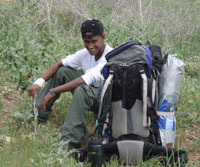 Mashresha combined his passions for Israel and hiking to teach his peers the values he learned on ITTA. Specifically, he taught environmental sensitivity through the model of concentric circles: moving from awareness of one's immediate surroundings, to one's community, country and the world as a whole. For the final event of the school year, Masresha initiated a Youth Village-wide clean-up day. with the support of the Yemin Orde's administration. All 400 students and staff in the Yemin Orde Youth Village joined forces to beautify their campus. These are only two examples of projects initiated by Kehilat Natan fellows during 2008. Others have taken action in different ways such as putting trash cans at their local bus stops, making sure there are recycling bins at school and teaching fellow students about conservation of water. 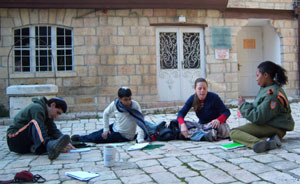 In March, Kehillat Natan fellows enjoyed a seminar in Jerusalem where they met members from Gari'n Dvash - SPNI's ecological commune and visited their communal sustainable house where they learned about different practical ways to implement environmental values in their homes. The Kehillat Natan fellows continue to inspire us, and we look forward to another year of creativity and learning with the new 2008-9 fellows. We hope that you will help us enable the Kehillat Natan Fellowship to grow. Your gift will help us support the fellows in their ventures during the year and determine how many applicants will join the next cohort of Kehillat Natan for summer 09! We encourage you to please donate today to help sponsor a Kehillat Natan fellow. Donations are tax-deductible in Israel, the US & the UK. Derech Hateva would like to thank 2007-8 outgoing fellows and Batel Meshel the Kehillat Natan Coordinator for all their hard work this year! Kehillat Natan 2007-8 fellows Alex, Masresha, Uriel and Michael, intern Nosson Levin with DH Director Yael Ukeles & KN Coordinator Batel Meshel at Yemin Orde Youth Village.